Yoolie's jewelry designs are poetic images, organic shapes meeting stainless steel in dynamic harmony and distinctive style. Yoolie Perry-Peleg is the sister of Nachshon Peleg...she is known for her footwear design company in Israel, while he is known for his Seeka jewelry design company in New York. Yoolie is working her own design magic with Nachshon's stainless steel lasercutting technology, she designs from Israel, and he makes it in America. Color pattern images are sealed within by acrylic resin, accented by colors from crystals, beads and enamel. Yoolie's jewelry collections are made in limited production, two color seasons each year, so it is very important that you order matching pieces while you can! The lasercut stainless steel elements are joined together for a pendant with movement, joined at sides to fancy link chain. Each pattern is covered by a dome of clear resin, the larger center pieces incorporate a bit of chain within, and an oval swings freely atop that. Colors featured include black, gold, silvery-white, celery green. Length on stainless chain adjusts 15-19"
Simple shapes in lasercut stainless steel, bold prints under domes of clear resin, tiny crystals accent the edges. Colors featured are black, gold, silvery white and celery green. Simple oval and teardrop shapes lasercut from stainless steel are all the more interesting by the tiny crystal accents extending off the edges. Lightweight and in a style and size that flatters most every gal. Patterns under clear acrylic domes. Colors featured are metallic gold, black and ivory. At top is stainless steel dotted by midnight blue and champagne crystals, steel bars joined below that hold up the more ornate shape that has patterns under clear acrylic, accented with more of the tiny crystal colors. Colors featured are blue, brassy gold, white. Sparkling gold glitter under clear dome top, and four tiles of pattern under clear resin, all set in lightweight lasercut stainless steel, tiny crystals accent edges. Colors featured are aqua, navy, gold, light sand. Lasercut stainless steel shapes, a curve at the top and larger medallion below, hold a variety of color patterns and metallic under domes of clear resin. Single pattern ovals dangle below. Attached on each side by fancy steel pillow link chain. Colors featured include aqua, navy, gold, light sand. Lightweight stainless steel, lasercut into the almost simple shapes. Filled with patterns under clear resin, accented by tiny crystals and beads. Colors featured are aqua, brown, orange. Extravagant, but lightweight, the stainless steel has been lasercut into intricate sahpes, swinging easily below post top. Open space mixes with that filled by colorful patterns under clear resin, tiny crystal and glass bead accents. 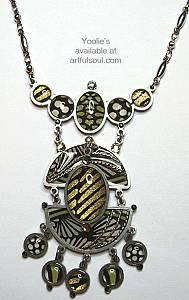 Interesting designs in lightweight cut stainless steel necklace that features neutral colors for versatility. Little crystal accents on each element, that are joined along the top by jump rings to curve gracefully around any neck. Colors featured include black, white, gold and blue. Length on stainless chain adjusts 16-19"
Design span along front: 6"
Lightweight and very interesting, the black and white floral pattern matched to spiral, tiny crystals accenting every element of stainless steel. Colors featured are black, white, gold, hint of blue. A trio of stainless steel shapes with interesting edgings, have pale blue glass on top two shapes, then pattern under clear acrylic dome at the bottom, accented by pacific opal color crystals. Colors featured are pale blue and vanilla. Tiny steel triangle at top has black crystal accent, then a scrolling steel shape holds another below that. Patterns under clear acrylic domes are accented by tiny garnet and black color crystals. Colors featured are orange, aqua, melon. Inverted heart shapes form top curving bar in stainless steel, small round steel pieces dangle freely below. All have patterns under clear acrylic domes, accented by garnet and black color crystals. Colors featured include orange, melon, gray, burgundy. Simply delightful earring in stainless steel, with pattern under dome of clear acrylic, accented by garnet and black color crystals. Colors featured are orange, melon. 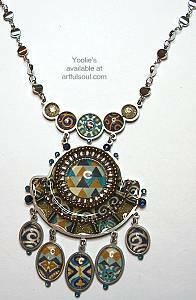 Read about what others think of Yoolie's jewelry! Instead of reviews for a specific product, this is a place to share about the designer line in general.